Since the blurb for GRETA AND THE GOBLIN KING covers the overall story really well let me skip the summarizing and dive right in. From the get-go I really liked Greta. She's a survivor and the sort of big sister I always tried to be with my little brother. The terror of her situation is pretty palpable from the beginning. In contrast, Isaac is mysterious and alluring but Jacobs never quite gives enough away to satisfy and that works well to keep you turning the pages. If this were just another YA fantasy romance we could stop there but this is very much an adventure with unexpected twists and the introduction of secondary characters that will have you rooting for them too. The world building is fabulous. Being in the midst of a chilly winter world where everyone wants to kill you on a regular day and goes full-on berserker monster at the full moon is just the sort of imaginative stuff I love. 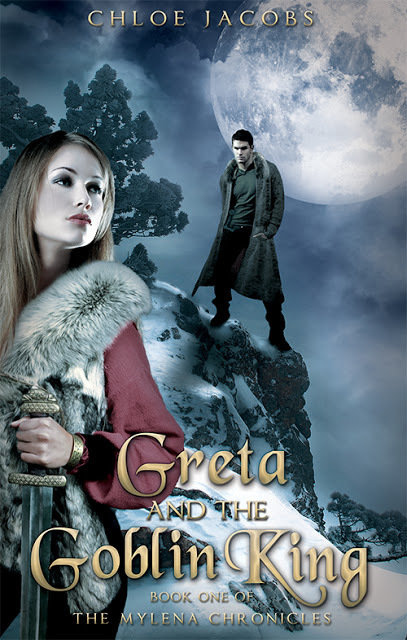 If you like your YA fantasy to be highly atmospheric I definitely recommend giving GRETA AND THE GOBLIN KING a read. On the whole it was a book I devoured and knew once I saw the last page approaching that I'd be hankering for another. If you enjoy Julie Kagawa's strong female protagonists and Jordan Dane's great secondary characters this is one I think you will love. I haven't read either of the books so I can't relate but I do love strong female protagonists.